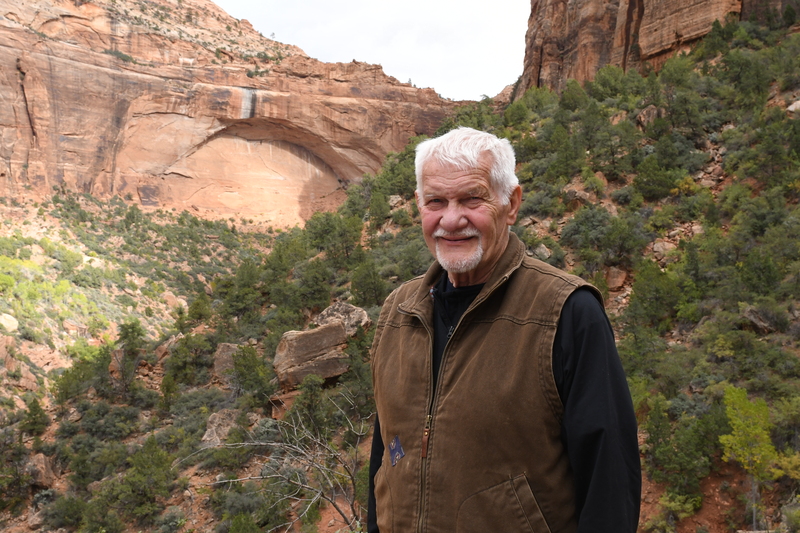 My father, Jerry Osborn, and I had a rare opportunity this October to take a road trip. Our goals were to see family, check out our hunting camp, and see some of the sights in the west. Dad is in his eighties now, so we don’t put off any chances to do neat stuff. This trip exceeded our expectations. Happily, we also were able to take in some elevators. Our stop at the elevator in Limon, Colo., proved to be a wonderful surprise. There was a truck at the co-op when we arrived, but the office door was locked, so I approached the elevator itself and called out to see if it was deserted. When I turned around, a man was approaching from the office. I went to meet him. Ed Owens was finishing up paperwork before going home for the night. I asked him about the history of the elevator, and he brought me into the office. Ed said his grandfather, S. L. Sitton, helped build the Limon elevator as well as the earlier, neighboring one in Genoa, Colo. He said his grandfather came into the area in 1939. He went away during the war, then came back and looked for whatever work he could find. Elevator construction provided a part-time laborer job that kept food on the table. The builder put up the elevator like a layer cake, letting each concrete layer cure for a period before adding another, rather than by the continuous-pour method pioneered by early elevator construction companies. 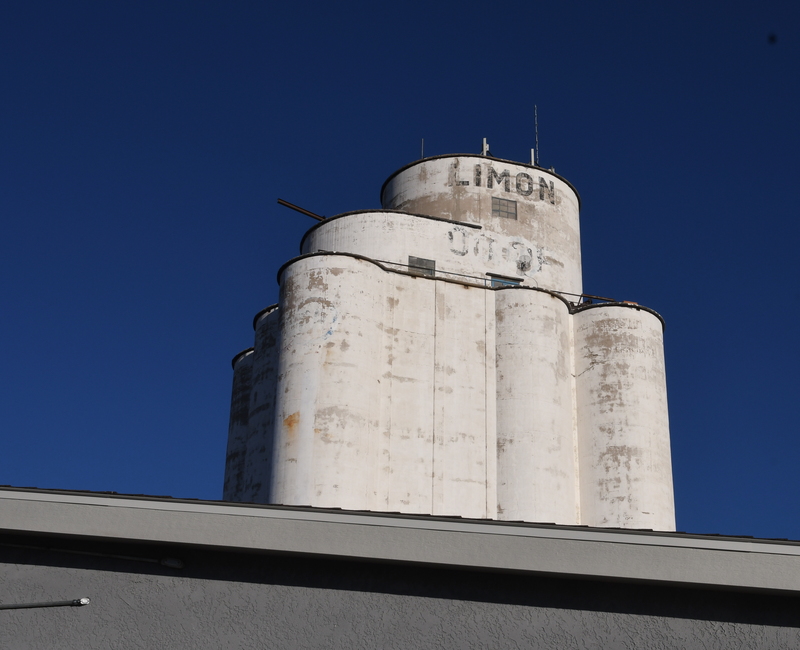 The Limon elevator was built in stages by farmers who built by day and farmed by night. I was impressed by Mr. Sitton’s fortitude, and I would have asked the old gentleman about it, but Ed said he was 97 years old and living in a nursing home in Flagler. He likely wouldn’t remember, and even if he did, he might not appreciate a visit. The Genoa, Colo., elevator is in a neighboring town. The best discovery was yet to come. 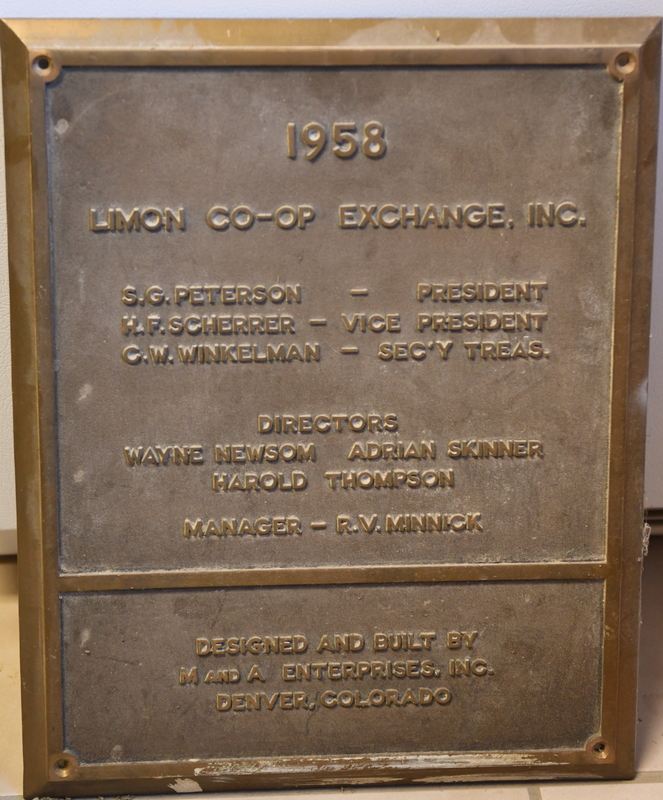 When Ed ushered me into the office, he showed me the bronze plaque which originally adorned the driveway of the Limon elevator. Ed said all of the directors listed on the plaque were dead by now. The elevator was built in 1958, so all the community leaders of the time were long gone. But the key bit of information on the plaque was the name of the builder and designer, M. and A. Enterprises, Inc., of Denver. I was very excited to see this name. The company was based in Denver, and the designer claimed to be the builder. Based on the design of the elevator, I had a strong suspicion of who that designer might have been. We now had a key piece of information. Followers of this blog know that we have puzzled over a few mysteries while tracking our grandfathers’ elevators. The most difficult story to reconstruct, thus far, was how the Mayer-Osborn Construction Company met its demise. The Denver-based enterprise lasted from 1949 until at least 1954, when my grandfather, William Osborn, apparently left the business. In the summer of 1954 he built the Blencoe, Iowa, elevator with the help of my dad, Jerry Osborn; by the summer of 1955, William was home from his Denver office and never worked elevator construction again. Meanwhile, his partner, Eugene Mayer, probably revived the company under various guises, but we know little of what became of him. 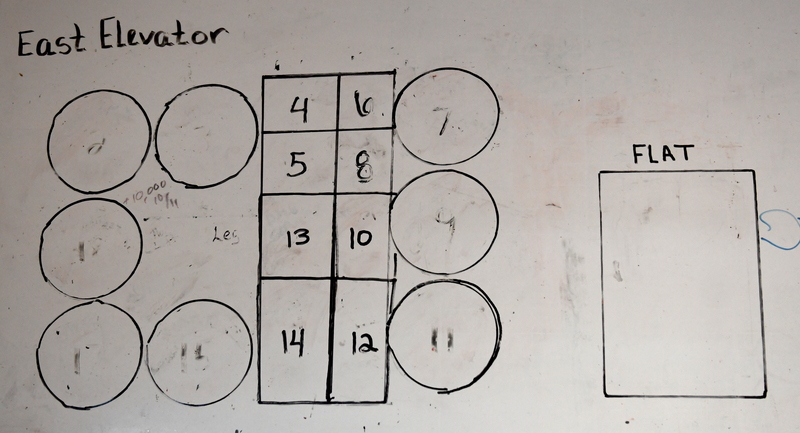 With our visit to Limon, Colo., we may have cracked the case. Usually, the simplest explanation is the true one. The quickest way to explain why a thriving company would go away is to look for a disaster. Family lore says there was one. But I suspect the rumor of a collapsed elevator, lost to a crew that “shorted materials” and made bad concrete, might have been a tall tale that sprung from a much more pedestrian event. No such disasters can be found in 1954 or 1955 newspaper accounts. The only related problem I could find occurred at the the Mayer-Osborn elevator in Blencoe, Iowa. During construction, when the elevator had reached about twelve feet high, the forms were slipped for the first time. As soon as concrete appeared below the slipped form, it began to slump and crumble. Bad concrete was indeed the culprit, and it necessitated a tear-down. To get back to a twelve foot height, the company had to add a day or two of expensive labor, which directly cut into profit. Could this event explain why William Osborn left the company? It’s the simplest explanation, so perhaps. Several subsequent elevators bore the Mayer-Osborn manhole covers, but Dad didn’t know about these elevators, and he was certain that by 1955, his dad, William, was home for good. 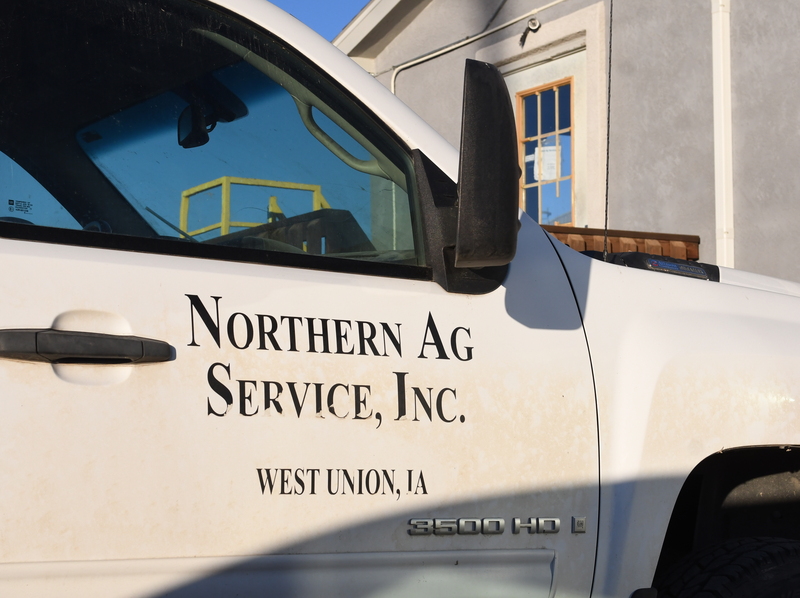 With its signature stepped headhouse, the elevator in Limon bears an uncanny resemblance to the first elevator Mayer-Osborn built in McCook, Neb. In fact, it is the same design, updated somewhat, and dated 1958. So it certainly went up after Grandpa left the business. But what about Eugene Mayer? Dad said that he was the designer, whereas Bill Osborn started as a carpenter and learned his construction skills on the job. 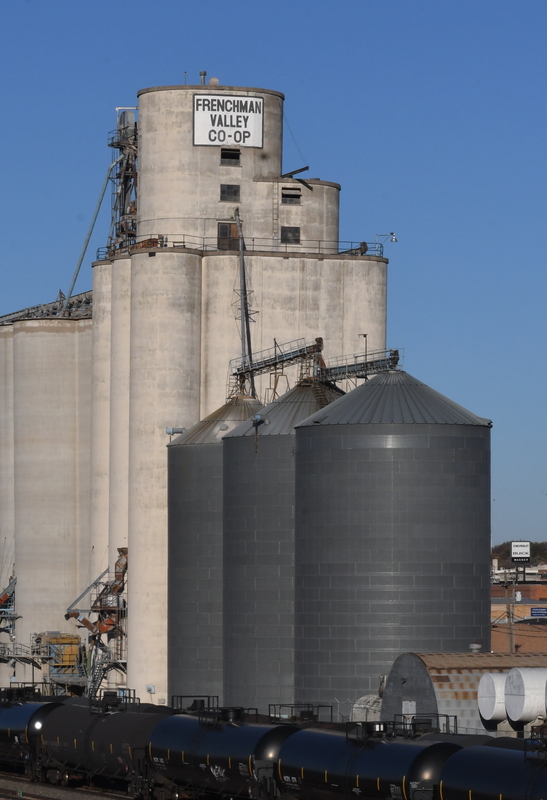 Mayer still retained ownership of his elevator designs, which could explain why McCook clones continued to pop up all over the plains in the mid-1950s. That brings us back to the builder of the Limon elevator, as inscribed on the plaque, “M. and A. Enterprises, Inc.” It seems inescapable that the “M.” was Mr. Eugene Mayer. The Limon elevator had newer innovations but was built haltingly. Plainly, all was not the same as it had been when Bill Osborn was on the job. Perhaps fewer workers were available. Fewer contracts were awarded as subsidies waned. So the big, ambitious, day-and-night event of an elevator project was toned down somewhat. I expect we will find that Eugene Mayer’s design was eventually sold and others built it, then it passed into history, along with the great concrete elevator boom. 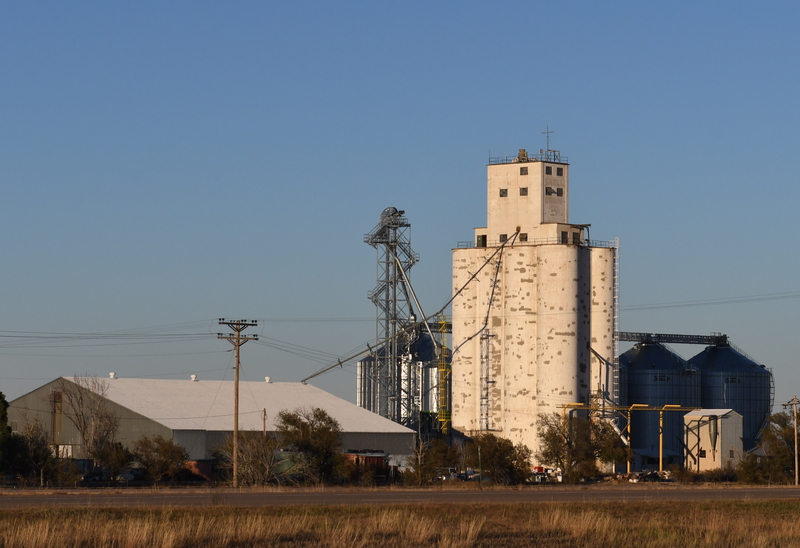 Happily, Limon’s elevator still thrives, and it gives us a peek at the amazing history of elevators on the American plains. The layout of the elevator is used to record the content of each bin. Flat storage is adjacent to the concrete elevator. Brad Perry shares another photo of an early Cargill elevator, this one at Athol, S.D. Athol and yesterday’s Ashton are twin towns in Spink County, a ways south of Aberdeen. Together they must have about 180 people. We hope those people appreciate the uniqueness of their elevators. Brad Perry shares another photo of an early Cargill elevator, this one at Ashton, S.D. As the Dakota Territory surrendered its prairie to agriculture in the 1880s, grain traders like Cargill expanded north and west. The initial heavy harvests from the rich earth raised demand for storage. Our friend, Brad Perry, saw the recent posts about Cargill history and was prompted to send some of his photos. “The Bagley name still shows up in South Dakota along U.S. 12,” Perry notes. This elevator turns up in an online source that says the location is Andover, just east of Aberdeen. “George C[olt]. Bagley was a member of a grain-trading family in eastern Wisconsin,” Wayne G. Broehl, Jr. writes in his massive history of Cargill. 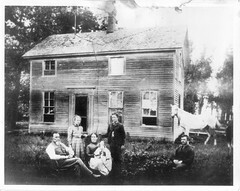 In the early 1880s, Wisconsin farmers were moving out of wheat and into livestock, so Bagley betook himself to South Dakota and partnered with Sylvester Cargill, one of the five Cargill brothers. Most of the Bagley & Cargill operations were in that part of the Dakota territory that later became the northeastern section of South Dakota. Similar to Jim Cargill’s larger-capacity operations in the Red River Valley, the Bagley & Cargill’s 13 structures at the firms 10 locations were more substantial (although only one was classified as an elevator.) This elevator, at Aberdeen, had a capacity of 25,000 bushels; the Andover warehouse had the same; the Groton operation had an 18,000-bushel capacity and the Bath warehouse, 15,000. An extensive biography of Bagley says the company concentrated on towns along the Chicago, Milwaukee, St. Paul and Pacific Railroad. Here he shows us one of Cargill’s early concrete elevators. It’s located in Elmore, Minn., a tiny town in Faribault County, in the south-central part of the state right on the Iowa line. As railroads pushed west in the 1870s, Will Cargill expanded his grain storage along the lines through northern Iowa and southern Minnesota. And as the era of reinforced-concrete elevators unfolded, Cargill’s successors continued building. We don’t know a thing about this elevator’s dimensions or who might have built it, but how impressive is the wooden elevator on the right? It stands almost shoulder to shoulder with the more modern concrete one. One thing leads to another, and somehow we found ourselves looking at someone else’s blog about grain elevators. “This blog hosts information about American Colossus: The Grain Elevator 1843 to 1943, written by William J. Brown and published by Colossal Books in February 2009,” says the blog’s introduction. Thanks to Google Books, we find the entire article by using this link.